Production: Black and white, 35mm, silent; running time: 17 minutes, some sources state 24 minutes; length: 430 meters. Released April 1929, Paris; re-released 1960 with musical soundtrack. Filmed March 1928 in Le Havre and Paris. Producer and editor: Luis Buñuel; screenplay: Luis Buñuel and Salvador Dali; photography: Albert Dubergen; production designer: Pierre Schilzneck; music: Wagner with some Argentine tangos (for 1960 version). Cast: Pierre Batcheff ( Young Man ); Simone Mareuil ( Girl ); Jaime Miravilles; Salvador Dali ( Marist priest ); Luis Buñuel ( Man with razor ). Buñuel, Luis, and Salvador Dali, Un Chien andalou , in L'Avant-Scène du Cinéma (Paris), July 1963. Buñuel, Luis, and Salvador Dali, "L'Age d'or" and "Un Chien andalou," New York, 1968. Kyrou, Ado, Le Surréalisme au cinéma , Paris, 1953; revised edi-tion, 1963. Moullet, Luc, Luis Buñuel , Brussels, 1957. Durgnat, Raymond, Luis Buñuel , Berkeley, 1968; revised edition, 1977. Breton, André, Manifestoes of Surrealism , Ann Arbor, Michigan, 1969. Buache, Freddy, Luis Buñuel , Lyons, 1970; as The Cinema of Luis Buñuel , New York and London, 1973. Matthews, J. H., Surrealism and the Film , Ann Arbor, Michi-gan, 1971. Aranda, Francisco, Luis Buñuel: A Critical Biography , London and New York, 1975. Hammond, Paul, editor, The Shadow and Its Shadow: Surrealist Writings on Cinema , London, 1978. Mellen, Joan, editor, The World of Luis Buñuel: Essays in Criticism , New York, 1978. Thiher, Allen, The Cinematic Muse: Critical Studies in the History of French Cinema , Columbia, Missouri, 1979. Williams, Linda. Figures of Desire: A Theory and Analysis of Surrealist Film , Urbana, Illinois, 1981. Buñuel, Luis, My Last Breath , London and New York, 1983. Rees, Margaret A., editor, Luis Buñuel: A Symposium , Leeds, 1983. Aub, Max, Conversaciones con Buñuel: Seguidas de 45 entrevistas con familiares, amigos, y colaboradores del cineasta aragones , Madrid, 1985. Oms, Marcel, Don Luis Buñuel , Paris, 1985. Talens, Jenaro, El ojo fachado: Lectura de "Un Chien andalou" de Luis Buñuel , Madrid, 1986. Buñuel, Luis, L' Age d'Or & Un Chien Andalou , New York, 1989. Buñuel, Luis, Un Chien Andalou , New York, 1994. Evans, Peter W., The Films of Luis Buñuel: Subjectivity & Desire , New York, 1995. Baxter, John, Buñuel , New York, 1999. Kinder, Marsha, editor, Luis Buñuel's "The Discreet Charm of the Bourgeoisie," New York, 1999 . Richardson, Tony, "The Films of Luis Buñuel," in Sight and Sound (London), March 1954. Prouse, Derek, "Interviewing Buñuel," in Sight and Sound (Lon-don), Summer 1960. Aranda, Francesco, "Surrealist and Spanish Giant," in Films and Filming (London), October 1961. Kast, Pierre, in Cahiers du Cinéma (Paris), December 1961. "Buñuel Issue" of La Méthode (Paris), January 1962. Durgnat, Raymond, in Films and Filming (London) April 1962. Robinson, David, "The Old Surrealist," in London Magazine , Novem-ber 1962. Vigo, Jean, in Avant-Scène du Cinéma (Paris), July 1963. Hammond, Robert, "Luis Alcoriza and the Films of Luis Buñuel," in Film Heritage (Dayton, Ohio), Fall 1965. Harcourt, Peter, "Luis Buñuel: Spanish and Surrealist," in Film Quarterly (Berkeley), Spring 1967. Gow, Gordon, in Films and Filming (London), January 1969. MacLochlainn, Alf, "Pointed Horror: The Films of Luis Buñuel and Georges Franju," in Film Journal (New York), Summer 1971. Lyon, E. H., "Luis Buñuel: The Process of Dissociation in 3 Films," in Cinema Journal (Iowa City), Fall 1973. Drummond, P., "Textual Space in Un Chien andalou ," in Screen (London), Autumn 1977. Thiher, Allen, "Surrealism's Enduring Bite: Un Chien andalou ," in Literature/Film Quarterly (Salisbury, Maryland), Winter 1977. Williams, Linda, "The Prologue to Un Chien andalou: A Surrealist Film Metaphor," in Screen (London), Winter 1976–77. Walker, I., "Buñuel's Half Century, Once upon a Time," in Sight and Sound (London), Winter 1977–78. Logette, L., "Surréalisme et cinéma," in Jeune Cinéma (Paris), April-May 1981. Wood, Michael, "The Discreet Charm of Luis Buñuel," in American Film (Washington, D.C.), September 1982. Bachelis, T., "Slovo o Sal'vadore Dali," in Iskusstvo Kino (Mos-cow), no. 6, 1989. Durgnat, R., "Theory of Theory and Buñuel the Joker," in Film Quarterly (Berkeley), no. 1, 1990. Jay, M., "The Disenchantment of the Eye: Surrealism and the Crisis of Ocularcentrism," in Visual Anthropology Review , vol. 7, no. 1, 1991. Revue Belge du Cinéma (Brussels), no. 33–34-35, 1993. Perry, J. W., " L'Age d'or and Un Chien andalou ," in Filmfax (Evanston, Illinois), August-September 1993. Goudet, Stéphane, in Cinémathèque (Paris), no. 6, Autumn 1994. "L'esordio e il destino del testo 'insegretito'," in Castoro Cinema (Milan), January 1996. 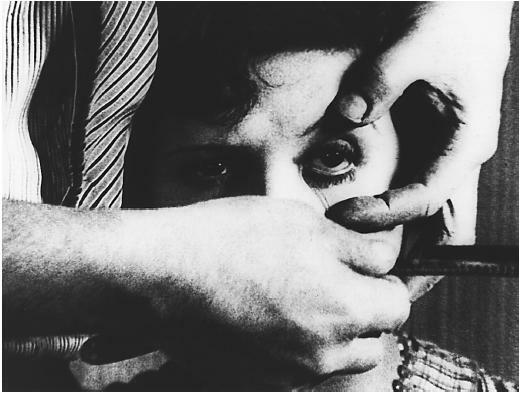 Un Chien andalou is probably the most renowned surrealist film. A collaborative work by Luis Buñuel and Salvador Dali, the film, intended as "a desperate and passionate appeal to murder," was immediately acclaimed for its poetry and beauty. Its enduring canonical status in film history is due not only to the reputation of its directors but also to its complex structure as a text. The film's disturbing imagery and transformation of narrative and continuity conventions help account for its appeal as a subject for critical scrutiny. The film does present something on the order of narrative, if elusively; continuity is sustained primarily through the recurrence of the same actor-characters. However the connection between events is decidedly ambiguous. Title cards running through the film undermine any sense of coherent organization by randomly changing the temporal order and standard of reference throughout the course of the film— "Once upon a time," "Eight years later," "Towards 3 a.m.," etc. This level of narrative disorientation is supported by the film's visual construction, with its frequent use of point-of-view and continuity cutting to link ambiguously related spaces. Near the end of the film, the female character leaves an apartment which is presumably located on an upper floor of an urban building; a slight breeze blows through her hair; she smiles and waves at someone off-screen, and the next shot places her on a beach. This kind of illogical transition and unexpected conjunction is commonly associated with Surrealism. It is also in line with Buñuel's attitudes about the potential of cinema: "It is the best instrument to express the world of dreams, of emotions, of instinct." Indeed, most analyses of the film follow cures offered by dream interpretation to explain the film. In some cases this has led to reading the film as a symbolic conglomeration in which each bizarre image or event stands for something else. The deciphering process leads to an understanding of the film's "hidden" meanings—usually construed as an attack on bourgeois modes of behaviour, an anti-religious diatribe, and/or a study of repressed sexual impulses. One of the key images here is that of the man, after he has been rebuffed by the woman, dragging the "baggage" of modern society with him, including two priests and two pianos surmounted by dead donkeys. More recently, critical attention has shifted to the film's processes of development and transformation, emphasizing the ways in which the film opens up possibilities of meaning (rather than containing it through a series of symbolic equivalents). These approaches draw on unconscious thought processes, instead of symbolization, to organize critical understanding. In this context the driving forces of the text are described in terms of condensation and displacement. In this same vein, greater consideration is devoted to the relationship between the film and its audience. By disrupting familiar patterns of spatial and narrative development. Un Chien andalou focuses attention on filmic processes of constructing and dismantling meaning. In fact the film opens with a brutal assault on vision, with the image of a razor blade cutting an eye. This not only throws into question the whole notion of sight as the locus of meaning, but more crucially shocks and disturbs an audience which is looking at the screen.